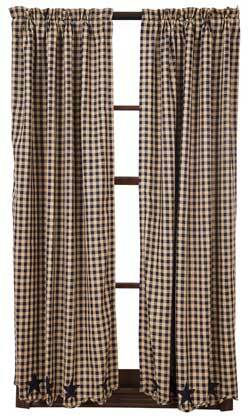 Navy Check Cafe Curtains - 24 inch Tiers, by Nancy's Nook. The Navy Star Collection features a classic primitive checked pattern of Navy Blue and TAN. This is for the 24 inch Tiers. Navy Check Short Panels, by Nancy's Nook. 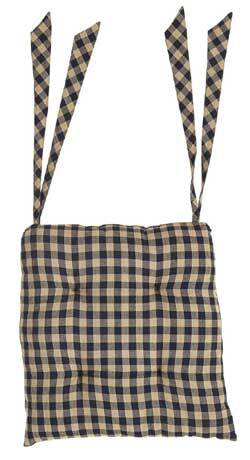 The Navy Star Collection features a classic primitive checked pattern of Navy Blue and TAN. This is for the Short Panels. Comes as a set of two pieces, each measuring 36 inches wide (for a total width of 72 inches), and 63 inches long. Measurements includes a 3.25 inch rod pocket and 2 inch header. Lined, scalloped edge. Tiebacks included. 100% cotton. Other items in collection also available! 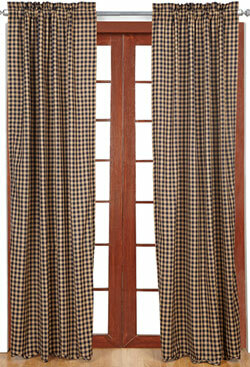 Navy Check Panels, by Nancy's Nook. The Navy Star Collection features a classic primitive checked pattern of Navy Blue and TAN. This is for the Panels. Comes as a set of two pieces, each measuring 40 inches wide (for a total width of 80 inches), and 84 inches long. Measurements includes a 3.25 inch rod pocket and 2 inch header. Lined, scalloped edge. Tiebacks included. 100% cotton. Other items in collection also available! 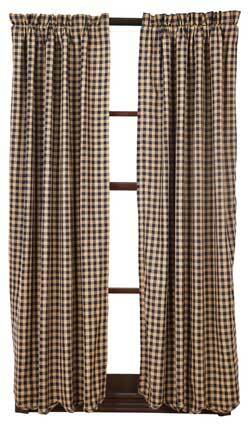 Navy Check Prairie Curtain, by Nancy's Nook. The Navy Star Collection features a classic primitive checked pattern of Navy Blue and TAN. This is for the Prairie Curtain. Comes as a set of two pieces, each measuring 36 inches wide (for a total width of 72 inches), and 63 inches long, with a center drop of 18 inches. Measurements includes a 3.25 inch rod pocket and 2 inch header. Lined, scalloped edge. 100% cotton. Other items in collection also available! Navy Check Prairie Swag, by Nancy's Nook. The Navy Star Collection features a classic primitive checked pattern of Navy Blue and TAN. This is for the Prairie Swag. Comes as a set of two pieces, each measuring 36 inches wide (for a total width of 72 inches), and 36 inches long, with a center drop of 18 inches. Measurements includes a 3.25 inch rod pocket and 2 inch header. Lined, scalloped edge. 100% cotton. Other items in collection also available! 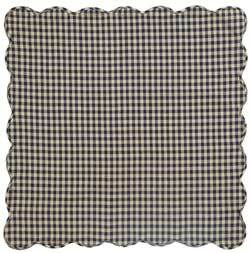 Navy Blue Check Round Tablecloth, by Nancy's Nook. Add a country touch to your table! Has navy blue & tan checks, and a scalloped edge. Navy Check Swag, by Nancy's Nook. The Navy Star Collection features a classic primitive checked pattern of Navy Blue and TAN. This is for the Swag. Comes as a set of two pieces, each measuring 36 inches wide (for a total width of 72 inches), and 36 inches long, with a center drop of 16 inches. Measurements includes a 3.25 inch rod pocket and 2 inch header. Lined, scalloped edge. 100% cotton. Other items in collection also available! 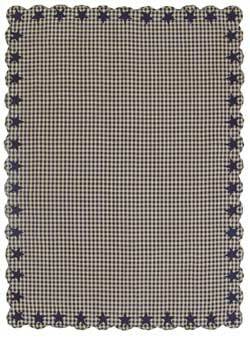 Navy Check Tablecloth, by Nancy's Nook. The Navy Star Collection features a classic primitive checked pattern of Navy Blue and TAN. This is for the Tablecloth, in the 60 x 60 inch size. Scalloped edges. 100% cotton. Other items in collection also available! 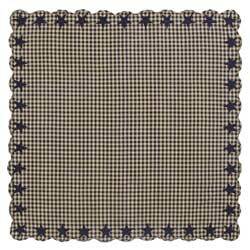 Navy Check Tablecloth, by Nancy's Nook. The Navy Star Collection features a classic primitive checked pattern of Navy Blue and TAN. This is for the Tablecloth, in the 60 x 80 inch size. Scalloped edges. 100% cotton. Other items in collection also available! 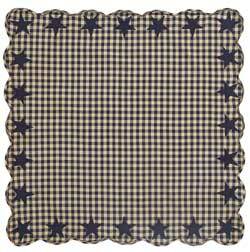 Navy Check Tabletopper, by Nancy's Nook. The Navy Star Collection features a classic primitive checked pattern of Navy Blue and TAN. This is for the Tabletopper, in the 40 x 40 inch size. Scalloped edges. 100% cotton. Other items in collection also available! 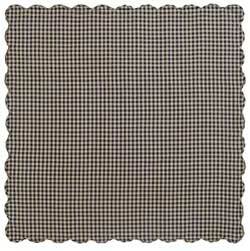 Navy Check Tiers, by Nancy's Nook. 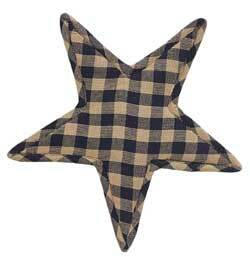 The Navy Star Collection features a classic primitive checked pattern of Navy Blue and TAN. This is for the 36 inch Tiers. Comes as a set of two pieces, each measuring 36 inches wide (for a total width of 72 inches), and 36 inches long. Measurements includes a 3.25 inch rod pocket and 2 inch header. Lined, scalloped edge. 100% cotton. Other items in collection also available! 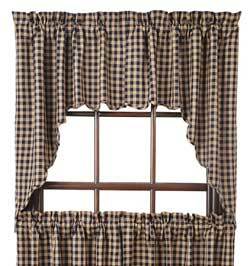 Navy Check Valance, by Nancy's Nook. The Navy Star Collection features a classic primitive checked pattern of Navy Blue and TAN. This is for the Valance. Measures 72 inches wide with a 16 inch drop. Measurements includes a 3.25 inch rod pocket and 2 inch header. Lined, scalloped edge. 100% cotton. Other items in collection also available! 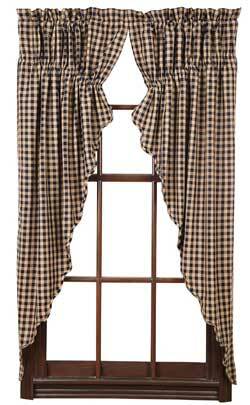 Navy Check Balloon Valance, by Nancy's Nook. The Navy Star Collection features a classic primitive checked pattern of Navy Blue and TAN. 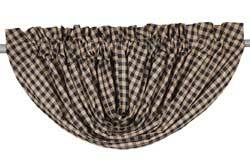 This is for the Balloon Valance. Measures 60 inches wide and 15 inch long. Measurements includes a 3.25 inch rod pocket and 2 inch header. Lined. 100% cotton. Other items in collection also available! 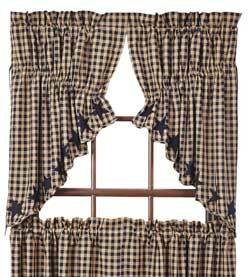 Navy Check Layered Valance, by Nancy's Nook. The Navy Star Collection features a classic primitive checked pattern of Navy Blue and TAN. 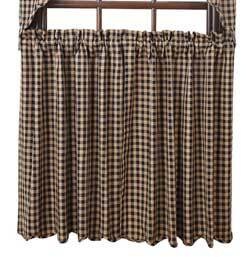 This is for the Layered Valance. Measures 72 inches wide with a 16 inch drop. Measurements includes a 3.25 inch rod pocket and 2 inch header. Lined, scalloped edge. 100% cotton. Other items in collection also available! Navy Solid Essentials, by Bella Taylor. 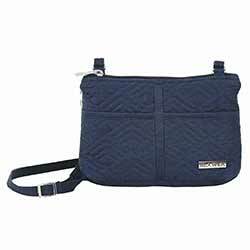 A 1920s-era fabric is the inspiration for the poly-cotton lining print and the quilting motif in our Navy solid color handbag collection. 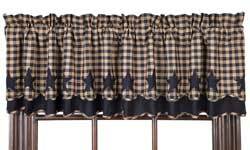 Navy Star Cafe Curtains - 24 inch Tiers, by Nancy's Nook for VHC Brands. The Navy Star Collection features a popular check of Navy Blue and TAN with appliqued stars. This is for the 24 inch Tiers. Navy Star Napkins, by VHC Brands. 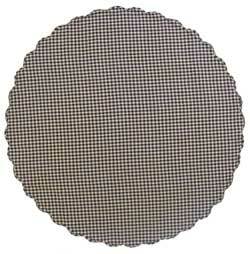 Set a classic country table with these dark navy blue and tan checkered napkins! Each corner is accented with an appliqued star. Sold in sets of SIX. Navy Star Short Panels, by Nancy's Nook. The Navy Star Collection features a classic primitive checked pattern of Navy Blue and TAN, with appliqued star(s) in solid navy blue. This is for the 63 inch Short Panels. Comes as a set of two pieces, each measuring 36 inches wide (for a total width of 72 inches), and 63 inches long. Measurements include a 3.25 inch rod pocket and 2 inch header. Scalloped edges, matching fabric tiebacks included. 100% cotton. Lined. 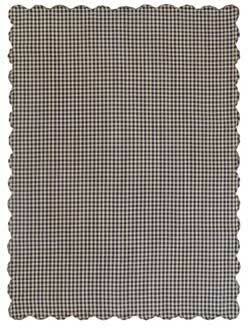 Matching table linens, window treatments, and more also available! Navy Star Panels, by Nancy's Nook. The Navy Star Collection features a classic primitive checked pattern of Navy Blue and TAN, with appliqued star(s) in solid navy blue. This is for the 84 inch Panels. Comes as a set of two pieces, each measuring 40 inches wide (for a total width of 80 inches), and 84 inches long. Measurements include a 3.25 inch rod pocket and 2 inch header. Scalloped edges, matching fabric tiebacks included. 100% cotton. Lined. Matching table linens, window treatments, and more also available! 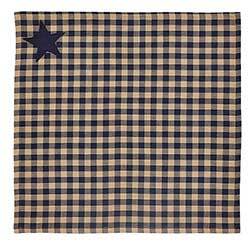 The Navy Star Placemat Set offers a timeless navy and tan check pattern and is decorated with navy appliqued stars. 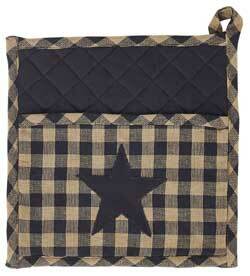 Navy Star Pot Holder, by Nancy's Nook. 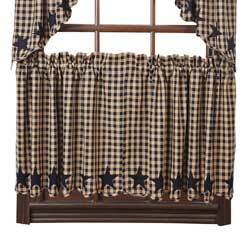 The Navy Star Collection features a classic primitive checked pattern of Navy Blue and TAN, with appliqued star(s) in solid navy blue. This is for the Pot Holder. Has an appliqued star on the front pocket, and a hanging loop. Measures approx 9 x 9 inches. 100% cotton. Matching table linens, window treatments, and more also available! Navy Star Prairie Curtain, by Nancy's Nook. The Navy Star Collection features a classic primitive checked pattern of Navy Blue and TAN, with appliqued star(s) in solid navy blue. This is for the Prairie Curtain. Comes as a set of two pieces, each measuring 36 inches wide (for a total width of 72 inches), and 63 inches long, with a center drop of 18 inches. Measurements include a 3.25 inch rod pocket and 2 inch header. Scalloped edges. 100% cotton. Lined. Matching table linens, window treatments, and more also available! Navy Star Prairie Swag, by Nancy's Nook. The Navy Star Collection features a classic primitive checked pattern of Navy Blue and TAN, with appliqued star(s) in solid navy blue. This is for the Prairie Swag. Comes as a set of two pieces, each measuring 36 inches wide (for a total width of 72 inches), and 36 inches long, with a center drop of 18 inches. Measurements include a 3.25 inch rod pocket and 2 inch header. Scalloped edges. 100% cotton. Lined. Matching table linens, window treatments, and more also available! Navy Blue Star Round Tablecloth, by Nancy's Nook for VHC Brands. 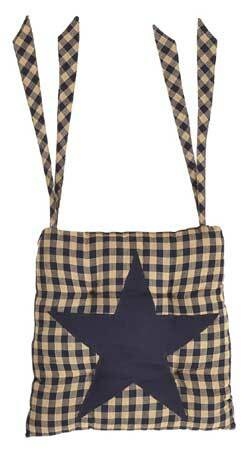 Features dark navy blue and tan checks and appliqued stars. Perfect for your primitive kitchen decor! 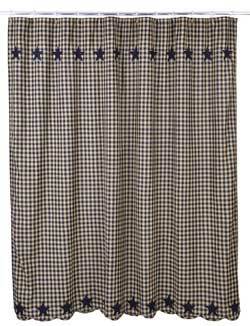 Navy Star Shower Curtain, by Nancy's Nook for Victorian Heart. The Navy Star Collection features a popular check of Navy Blue and TAN with appliqued stars. This is for the Shower Curtain. Measures 72 x 72 inches. Scalloped edge, with button-holes along the top for your shower curtain hooks. 100% cotton. Other items in collection also available! Navy Star Swag, by Nancy's Nook. 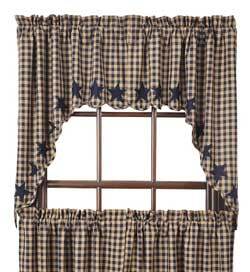 The Navy Star Collection features a classic primitive checked pattern of Navy Blue and TAN, with appliqued stars in solid navy blue. This is for the Swag. Navy Star Table Runner, by Nancy's Nook. The Navy Star Collection features a classic primitive checked pattern of Navy Blue and TAN, with appliqued star(s) in solid navy blue. This is for the Tablerunner in the 54 inch length. Scalloped edges, appliqued stars along each edge. Measures approx 13 x 54 inches. 100% cotton. Matching table linens, window treatments, and more also available! Navy Star Table Runner, by Nancy's Nook. 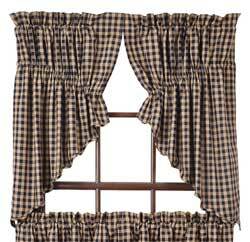 The Navy Star Collection features a classic primitive checked pattern of Navy Blue and TAN, with appliqued star(s) in solid navy blue. This is for the Tablerunner in the 72 inch length. Scalloped edges, appliqued stars along each edge. Measures approx 13 x 72 inches. 100% cotton. 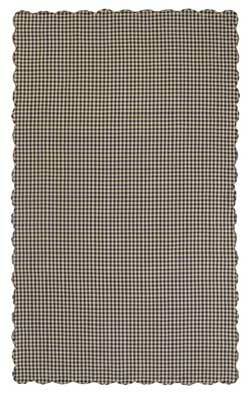 Matching table linens, window treatments, and more also available! Navy Star Tablecloth, by Nancy's Nook. 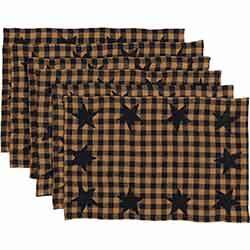 The Navy Star Collection features a classic primitive checked pattern of Navy Blue and TAN, with appliqued star(s) in solid navy blue. This is for the Tablecloth in the 60 x 60 inch size. Scalloped edges, appliqued stars along each edge. 100% cotton. Matching table linens, window treatments, and more also available! Navy Star Tablecloth, by Nancy's Nook. The Navy Star Collection features a classic primitive checked pattern of Navy Blue and TAN, with appliqued star(s) in solid navy blue. This is for the Tablecloth in the 60 x 80 inch size. Scalloped edges, appliqued stars along each edge. 100% cotton. Matching table linens, window treatments, and more also available! Navy Star Tabletopper, by Nancy's Nook. The Navy Star Collection features a classic primitive checked pattern of Navy Blue and TAN, with appliqued star(s) in solid navy blue. This is for the Tabletopper, which measures 40 x 40 inches. Navy Star Tiers, by Nancy's Nook for Victorian Heart. The Navy Star Collection features a popular check of Navy Blue and TAN with appliqued stars. This is for the 36 inch Tiers. 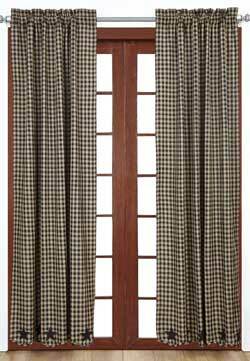 Each panel measures 36 inches wide (for a total width of 72 inches) with a 36 inch drop. Measurements includes a 3.25 inch rod pocket and 2 inch header. Lined, scalloped edges. 100% cotton. Other items in collection also available! Navy Star Trivet, by Nancy's Nook for Victorian Heart. The Navy Star Collection features a popular check of Navy Blue and TAN with appliqued stars. This is for the Trivet. Measures approx 10 x 10 inches. 100% cotton. Matching table linens, window treatments, and more also available! 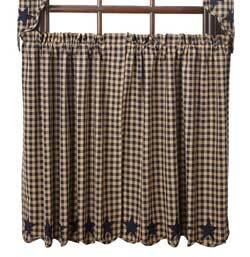 Navy Star Valance, by Nancy's Nook. The Navy Star Collection features a classic primitive checked pattern of Navy Blue and TAN, with appliqued star(s) in solid navy blue. This is for the Valance. Measures 72 inches wide with a 16 inch drop. Measurements includes a 3.25 inch rod pocket and 2 inch header. Lined, scalloped edge. 100% cotton. Other items in collection also available! 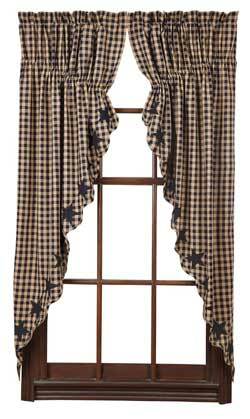 Navy Star Layered Valance, by Nancy's Nook. The Navy Star Collection features a classic primitive checked pattern of Navy Blue and TAN, with appliqued star(s) in solid navy blue. 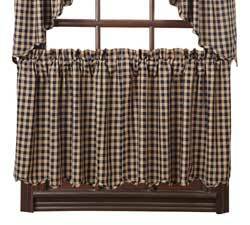 This is for the Layered Valance. Measures 72 inches wide with a 16 inch drop. Measurements includes a 3.25 inch rod pocket and 2 inch header. Lined, scalloped edge. 100% cotton. Other items in collection also available!